Here we go! RJ Boyle is joined by Art Sapp for an inshore sport fishing instructional series that will be months in the making. These gurus of game fishing are going to drop bombs of insight and experience as they go "In the Spread" along south Florida's Atlantic coast. You name the species and they will be on it. Also, the "In the Spread with RJ Boyle Daytime Swordishing" series will be released within the month. So, stay tuned as we dial it up on the world of sport fishing media. 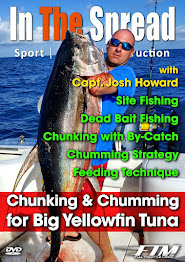 Check out the Sport Fishing Safari blog for more info.